Solar power is nuclear fusion power. If you can set up a reasonably priced system to collect this free energy, then every kilowatt-hour of energy collected saves you real money, and is a modest, but legal form of TAX DODGE, because you are avoiding GST by saving significantly on your gas and/or electricity bills. This is a new design concept for the Cinderella of the energy industry: the unglamorous, unsung heroine of energy supply: the Solar Water Heater. The only really novel feature is the use of a very small photovoltaic panel to directly drive an efficient DC water pump, with the components carefully matched for power ratings to ensure the pump only moves water when there is sufficient solar radiation to provide some water heating. 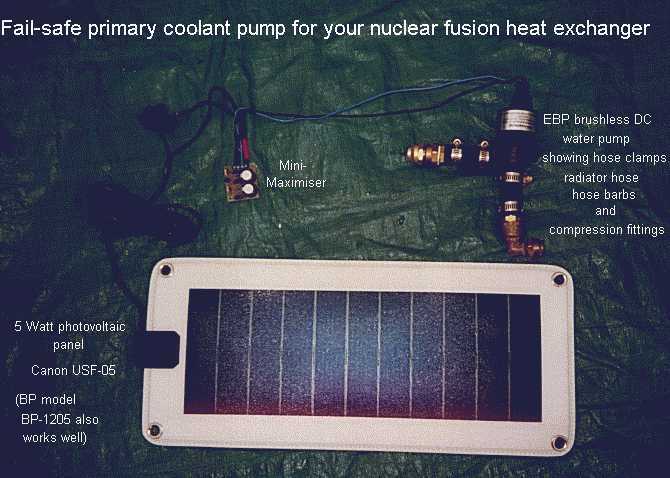 Scientifically speaking, a solar water heater can be accurately described as a Nuclear Fusion Primary Heat Exchanger. It collects radiant energy from that huge nuclear reactor in the sky (the Sun!) and traps it in a flat sheet of metal. Water tubes then transfer the heat away for storage and later use. This is directly analogous to heat exchangers inside an Earth-based nuclear power plant, where in fact much of the electricity generated really is squandered on low-grade heating applications, such as domestic hot water. K4 can be installed as a retrofit to an existing 300 to 400 litre ground-level mains pressure storage hot water tank for under $2000 with half a day's DIY labour, though strictly speaking a plumber should make the final connection. It should provide a tax-free ten per cent return* on that investment for around 20 years, (*maybe much more depending on the cost of gas and electricity after 1st Jan 2001). It is a good idea to connect your Mini-Maximiser2, solar photovoltaic panel and EBP, so that you can test the EBP in a bucket of water: it should commence pumping when, under a bright cloudy sky, the PV panel is delivering about 70 mA into a short-circuit (the shunt in your ammeter). This is the sort of radiant sky which will make a black car dashboard comfortably warm, and is therefore the same level of radiation at which your solar collectors will be able to start delivering usefully warm water into the hot water storage tank. To emphasise the amazing characteristics of the Mini-Maximiser, please note that with a conventional DC power source, the EBP pump will remain stalled until 1.5 amperes is flowing through it, but will start and run with only one-twentieth of that current from a 12 volt PV panel, if the Mini-Maximiser is present in the circuit. Update May 2005: several years' experience with the EBP water pump leads us to remark that the impeller's bearings do gradually wear, eventually resulting in the main spinning magnetic yoke rubbing on the motor housing. The motor's serviceable life is not however over, and it can usually be kept operational in this condition for another 3 to 5 years by using a photovoltaic panel upgraded to 10-watts rated power. Attempts at repair by reboring the bearing, and inserting either a precision-machined PTFE ("Teflon") or phosphor bronze sleeve, have proved problematic. When the motor refuses to spin reliably with a 10-watt PV panel, it is thus recommended that the pump be replaced with a new unit. Even then the pump may be quite suitable for use in less critical applications. Note well that the circulation pipes (red and blue lines in the diagram) contain NO non-return valve, and inevitably a small amount of warm water will flow back up into the solar panels each evening. In practice this has been demonstrated to be an insignificant loss. Indeed, if household occupants use some water in the late afternoon, there will be a layer of cold water at the bottom of the tank in any case. When fully assembled and checked, your plumber must pressurise the tank and bleed all the air out of the highest points in both the storage tank and in the solar panels. No bleed valve is necessary, but at least one compression fitting must be accessible so that it can be loosened until air and water escape: WARNING - if it is a sunny day, escaping scalding water can burn your hands, so thick rubber gloves may be required. 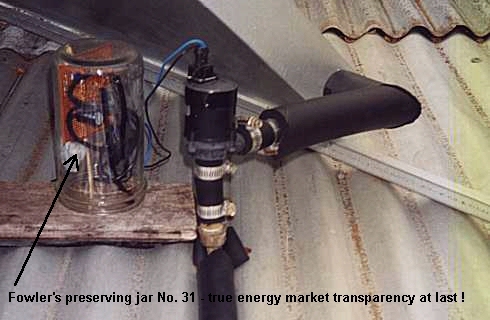 Failure to perform this operation will result in a non-functioning system, as the EBP will not provide a forceful enough flow to flush air down to the tank at ground level (not from a 5-watt PV panel, at any rate). In sunny weather you will be able to tell that the system is working by feeling that the return pipe from the solar collector (red) feels considerably hotter than the other (blue) pipe. The pump makes a faint whining noise because the Mini-Maximiser feeds it with brief pulses of DC energy, and this sound usually indicates that the pump is spinning, but not necessarily. If you buy a new car, you don't normally drive around with the handbrake applied. If you have a bright lamp, you don't hide it under a bushell. Similarly, now that you have invested all that hard-earned money in your new hot water system, it is a good idea to consider the best way to optimise its performance, and return on capital investment. Disconnect the heating element at the bottom of the tank, and use the booster element at the top alone. Check with your power company if you can still get cheap tariffs in this configuration. If you replace the upper boosting element with a 2.4 kW element, it can be run from an ordinary 10 amp power point, via a time switch. If you set the time switch to be OFF from 7am to 4pm each day, this can greatly reduce electricity requirements, though day-rate electricity will cost a lot more, thus extending the payback time for your investment. Set the upper element thermostat to the lowest possible temperature setting. If it is not adjustable, then get your electrician to install an adjustable one. Provided it is not against local regulations, I strongly recommend a setting of 40-45°C (on at 40, off at 45)- this can save you very many dollars in a year, and adaptable individuals can cope well with showers, if not baths(! ), at these temperatures. Turn off all electric supply to the heating elements, and "see how you go" for the six months from spring equinox (21 September) to autumn equinox (21 March). You will fairly soon learn to judge which family member is wasting water in sunny weather, or how many days of normal usage and cloudy weather result in unacceptably low supply temperatures. You may find that you can even leave the electric boosting off for several days at a time during sunny winter weather. Such a strategy will significantly shorten the period for a "full return on investment". Without any electric heating element, this system makes a perfect pre-heater for an existing gas-fired storage water heater. Just cascade the hot outlet from this tank into the cold inlet of the gas hot water service. Again, it would be nice to be able to shut down and bypass the gas system for 6 months each year. A couple of hundred thousand Tasmanian householders and landlords could get funds direct from savings or a community bank loan and challenge the might of the Tasmanian Government and of NGIL, by confronting the Basslink proposal head-on with $500 million worth of solar water heating (clean efficient nuclear fusion power). Since Australia has launched itself so enthusiastically into microeconomic reform and competition policy, they can hardly whinge about a little bit of competition from "poxy old solar water heaters" can they?? "We could therefore expect about 50 to 60 per cent of that water usage to be avoided in a typical year, but crucially could routinely expect about 3.68 million megalitres of precious hydro water conservation during one drought summer in Tasmania. (6 months October - March inclusive) This is a case of near-perfect synergy and timing, in contrast to Basslink which has rather poor timing in being a generation too late in failing to realise that global warming is real, and that their project will not make money if they have to pay for the excess emissions to be generated as a direct consequence of Basslink, or if they are forbidden from allowing southward flows of coal power into Tasmania." "Surely solar water heating systems throughout Tasmania must provide an order of magnitude more security of supply by using distributed (solar power) energy conversion compared to Basslink relying on a single expensive undersea cable, prone to accidental trawler damage, accidental anchor-dragging damage, or non-accidental events. Witness the broken Internet cable in the South China Sea. "If the mean head of water pressure in Tasmania is perhaps three times the Ord River turbines, I would expect that the water volumes saved would work out to about one-third of the figures determined above." by the energy flux from your fusion reactor core. This information is of a non-commercial nature, and I have no commercial interest in any solar technology industries or automotive accessories industry. The use and mention of commercial products is not an endorsement of any individual manufacturer or their product. If you can find equivalent products from other manufacturers, then please use them. 4. Download (right click.., save as..) this whole web page as a printable PDF, and email a copy to all your friends and relatives. You should even send it to your enemies, because if they don't reduce their greenhouse emissions too, we are all up the proverbial creek!